Monterra where the living is at its finest, is the location for your vacation rental condo. The condo has two bedrooms and two bathrooms and is beautifully custom decorated for your comfort. The first bedroom has a king bed, and an ensuite bathroom. The second bedroom has a bunk bed set up with a queen bed on the bottom and single up top. There is a shared bathroom across the hall. The open concept features a sitting area with gas fireplace, dining area, and the kitchen with its upscale finishes. There is a gas cooktop, refrigerator, side by side washer and dryer, and the kitchen is fully equipped with all you need for preparing your meals (see amenities tab for details). There is a private balcony with a view into Glacier National Park - a "Peek"! A one car attached garage is convenient for entering, and there is guest parking a short distance way. The clubhouse is available to you with this rental with all of the sumptuous amenities that include swimming pool, hot tub, fitness room, media room and a lovely sitting area to enjoy. There are also tennis courts. 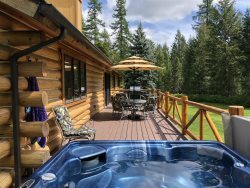 You will be minutes away from the charming town of Whitefish with its art galleries, shops, railroad museum, Depot Park, brewery, distillery, restaurants and salons! Historic and upscale you'll find everything right here. You are also a very short drive up Big Mountain to Whitefish Mountain Resort for 94 downhill ski runs and all kinds of winter adventure. And in summer there is a myriad of things to do: zipline, lift ride to the summit house (great views! ), mountain biking and hiking and tree top adventures. Spring and Fall in our valley are gorgeous too! The backbone of the continent, Glacier National Park is a lovely 30 minute drive to the west entrance, a must see in all seasons. This beautiful vacation rental is available by the month only. Perfect dogs may be considered with approved applicaton and an additional fee. Come visit our magnificent northwestern Montana valley and explore all of the wonders under the Big Sky! Clubhouse with Lots of Amenities (Pool, Hot Tub, Tennis Courts, Fitness Room, Media Room)!